The most common damage to trees tends to be from cars hitting the lower parts of trees and trucks hitting higher on the trunk and the undersides of major limbs. Trees don’t heal as we do; when they are injured, the wood on the outside of the wound can only creep in year by year until it closes over. This is called compartmentalization of decay in trees, or CODIT. When a tree you love has a big wound, the bridge graft is your best aid if you are willing to put the time and work into the job. It is a type of repair graft, not used to propagate plants but to heal them. The tree is special and/or the wound is large. This graft takes a lot of work. It’s not worth it for small wounds that will heal well on their own, or trees without a major role in your landscape. During the active growing season. 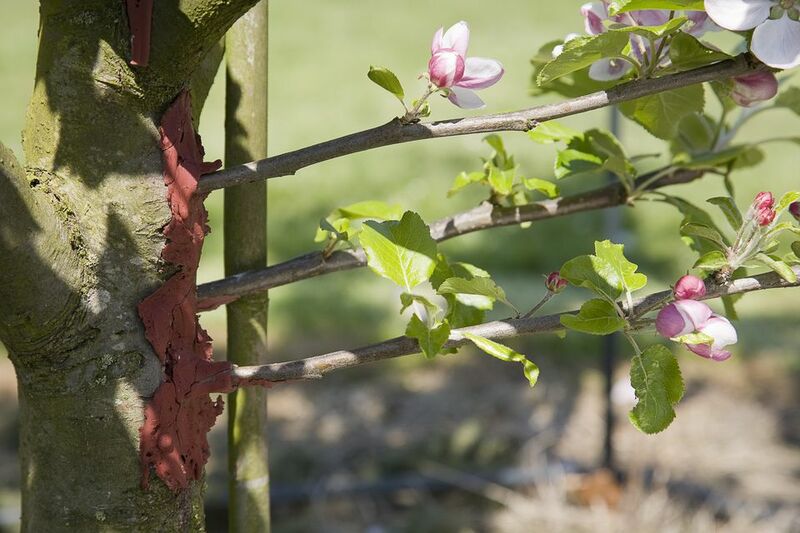 You need bark that will “slip,” and this is only possible during the active season of growth in spring through summer. Early spring is best. Trim the wound edges to a cleanly cut and smooth edge on top and bottom. Remove all ragged and dead tissue; the edges should be made entirely of live tissue. Cut appropriate scions. A natural place to get scions is the young, last year’s growth of the tree you are working on. A pole pruner is your best friend, here. Cut them to the correct length to bridge the wound, with slanting cuts on either end. The slants should go in opposite directions so that the scion now has a long side and a short side. Cut slits in the bark above and below the wound. Cut pairs of slits distanced at the exact width of the scion, a pair just above the wound and a pair just below it. These slits should allow you to pry up a free end of bark to get underneath it. Force the ends of the scion under the slit bark. The long end of the scion faces the tree. To work it in, pry up the bottom slit bark—possibly with a chisel—and firmly force the bottom of the scion into the tight space. Do the same to work the top of the scion into the top slit directly above. The scion is now firmly fixed in place, all parts touching or nearly touching the tree, not bowed out too much. Nail the ends in place. Repeat step four laterally to add a grate of many scions spaced about an inch and a half apart. Wax all of the unions and the exposed wound wood. Perform standard aftercare for the new graft. The Minnesota Horticulturist, Volume 50. Minnesota State Horticultural Society, 1922.